I don't quite know if I would have liked this book better if I had read it closer to when I read book one. Its been almost three years since I read the first book, so to say I didn't remember much would be an understatement. Once I got further into the story some things came back to me, but I think overall, I felt kinda meh about the story. 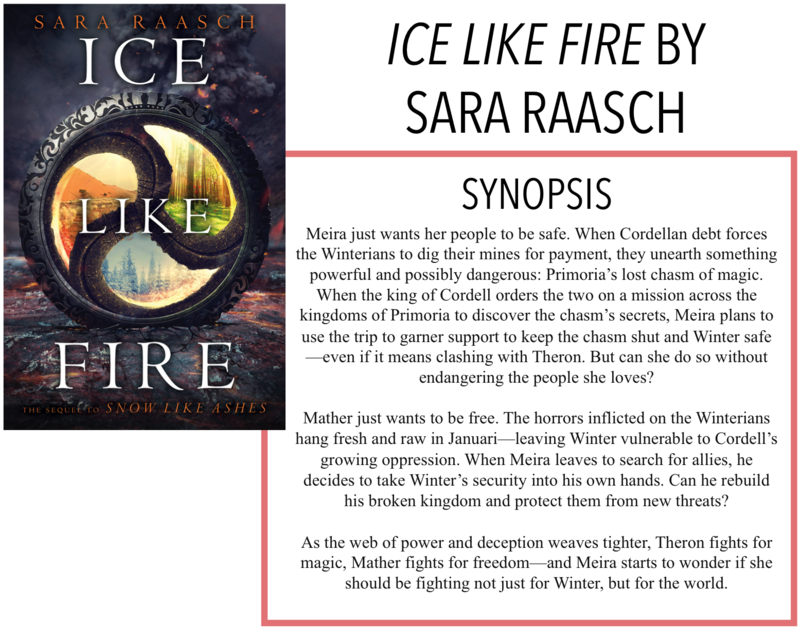 I am back with another book review, today it is Ice Like Fire by Sara Raasch. This book (presumably) picks up shortly after the first one ended. Meira is traveling back to Cordell with Theron to tell his father, the king of Cordell about the secret magic chasm they found. The magic stored inside may just be enough to prevent the misuse of magic in all the kingdoms forever. But first Meira must travel to each of the kingdoms to find the three keys that will open the door. She sets off with Theron but soon finds herself with an unlikely ally and an unexpected enemy. I really want to stress two things before I get too far into this review, because I can already tell that it's not going to be super favourable to the book. Firstly, because it had been so long since I read the first book and because much of the excitement I felt with book one had dissipated, I don't think I was fully invested in the story. Secondly, I've been fighting off a slump for a while now, so some of my displeasure could very well have been related to that, not the book itself. These are just some things to keep in mind, a grain of salt for reading my review. Alright, so let's talk about the book. Like I said, it's been a while, but I do remember there were two sets of kingdoms, Seasons (Winter, Spring, etc.) and Rhythms (Cordell, Yakim, etc.). What I don't remember is much about them. Raasch does give a bit of a brief descriptor for each of them when they come up in the story and if you read this book close to the first, things would probably be better, but I just found that I couldn't keep them straight, trying to remember who was fighting with who, etc. The story alternates between Meira's first-person account and Mather's third-person account. Once I got used to this set-up, it was fine. But at the beginning, things were a little jarring. I also found that I didn't really care what was happening with Mather all that much. I know it was to show what was happening in Winter/Cordell, but I just found it a bit unneeded. Towards the end of the book, it was appreciated, but there were some points before that that I just didn't think his perspective was helpful. I found myself getting easily irritated by Meira, especially early on in the novel, and I think that affected how I felt about the rest of the book. I understand she was still getting her footing, but she was blindly trusting people (cough Theron cough) even after they gave her MULTIPLE reasons to distrust them. I don't know if she just didn't know what to do but sometimes she made some questionable decisions. I don't know if it was just me, but I found the pacing of this book to be pretty slow. For almost 500 pages, I would say a good third wasn't necessary. And that's really a shame because I remember really enjoying the first book. I was barely able, however, to finish this one. I definitely thought about DNFing it multiple times and I think I may have if I hadn't already purchased book three. I think it really boils down to the fact that this was a second book in a trilogy. It served as a means to the end of the story with book three, and while I think I will finish it off, I felt like this book was just getting interesting before it ended mid-scene. Overall, not a favourite, but I think I'll finish the series.